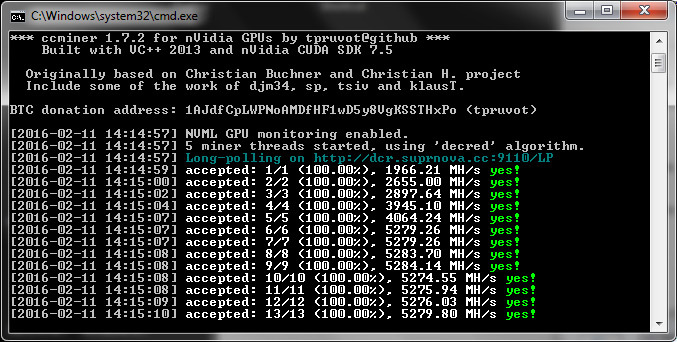 Version 1.7.2 of tpruvot’s ccMiner fork source) for GPU mining on Nvidia-based video cards has been released and it comes with official support for Vanillacoin (VNL) as well as Decred (DCR) support. Below you can find compiled Windows binaries to try out the mining them, both are Blake256-based, but with some different requirements such as the need to use longpoll and getwork, and no support for stratum for Decred for example. There are two versions available, the 32-bit one is with support for older Compute 2.1 and 3.0 GPUs while the 64-bit version is for the newer Compute 3.5, 5 and 5.2 cards. We have tested the new release on GTX 970 and the results are slightly better at about 1.35 GHS (with the 64-bit miner) than what we are getting with the cgminer fork for Decred that relies on OpenCL that is also compatible with Nvidia cards. The ccMiner fork might be helpful to people that are having very high CPU usage with cgminer that results in lower mining performance, though the CPU load is still not that low even with ccMiner. Also the use of ccMiner for mining Decred could result in less rejected shares from the pool and no weird errors as some people are experiencing with cgminer, so if you are mining DCR on Nvidia with cgminer, then you should try with ccMiner as well.